T5 Superlight is the first model built using our new Type 5 platform. Type 5 is the latest iteration of the Crumpton road frame. It is a platform based on our own proprietary, multi-shaped carbon tubing. The tubing is designed and manufactured in house to our exacting standards. Crumpton controls the process from start to finish. We have been able to reduce frame weight and maintain the ride quality and durability that is the Crumpton Cycles reputation. The unidirectional tubing also sets it apart from our other carbon frames. 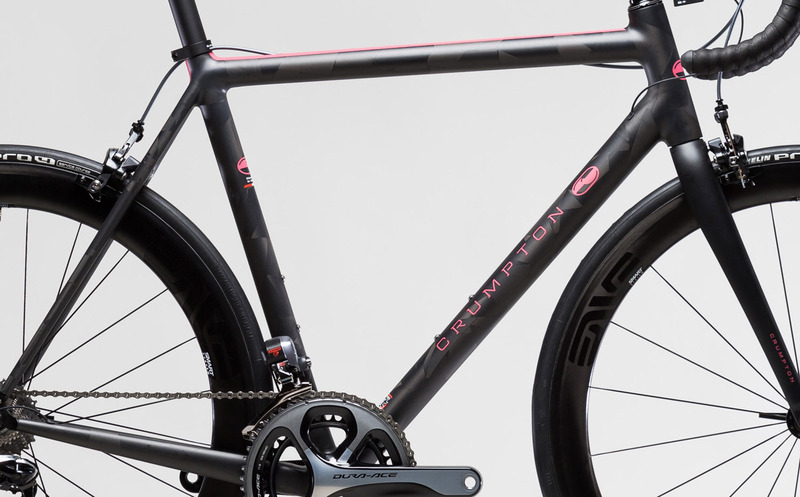 With hundreds of our SL and Corsa carbon frames being ridden and enjoyed over the last 10 years Crumpton Cycles is looking forward to setting new and higher standards with our latest tubing design and ever evolving use of carbon fiber materials. T5 Superlight with CCF finish Crumpton tubing. Matte with pink graphics.